Abduction refers to the movement of structures or limbs away from the middle of the body by the contraction of abductor muscles. Toes and fingers are pulled apart by contraction of the abductor muscles. The physiological function of a muscle is related to fiber length and cross-sectional area. It has been found that abductors usually have a shorter muscle fiber length (in general) than an adductor muscle. There are many examples of abductor muscles in the human body. Some are even partly named for the action they perform. For instance, abductor pollicis brevis and abductor pollicis longus which are two muscles acting on the thumb, causing the abduction of the thumb. The abductor pollicis longus, as the name implies, is a long muscle that attaches to the bones of the forearm and thumb. The dorsal interossei are muscles found between the long bones that bring about abduction of the fingers. Part of the deltoid muscle is responsible for abduction of the arm, as is the supraspinatus muscle. The deltoid muscle covers the shoulder region. The supraspinatus is attached to the shoulder blade (scapula) and the upper arm bone (humerus). These muscles are often called abductors of the hip. They include the following muscles: gluteus minimus and gluteus medius which are found in the gluteal region. The gluteus medius is the larger of these two muscles and is very important in keeping the hip stable during walking. Abduction muscles allow you to move your legs sideways, and also function in stabilizing the hip joint. Abductor muscles found in the hip region contract to produce a lateral movement of the pelvic region of the body. Any weakness of abductor muscles that are found in the hip region can cause an abnormal gait. Abductor movement of the big toe is brought about by the abductor hallucis and movement of the little toe is brought about by the digiti minimi pedis. The dorsal interossei bring about some abduction of the toes. Adduction refers to the movement of structures or limbs towards the middle of the body by the contraction of adductor muscles. Toes and fingers are moved closer together by contraction of the adductor muscles. Adductor muscles generally have a longer average muscle fiber length when compared with an abductor muscle. Longer fibers and fibers with greater cross-sectional area produce greater force, even within a type of muscle. Research has shown therefore that the adductor magnus, which is longer and has greater cross-sectional area than adductor longus and adductor brevis, also has greater force. The adductor pollicis is a muscle that acts on the thumb. The palmar interossei are muscles found between the long bones that bring about adduction of the fingers. The latissimus dorsi is a back muscle that helps in adduction of the arm. The pectoralis major is a very large chest muscle that is involved in adduction of the arms. There are three very important adductor muscles that are found on the human thigh. These are the adductor magnus, adductor longus and adductor brevis. These muscles attach to the lower parts of the pelvic bones and to the long bone (femur) of the upper leg. The contraction of the adduction muscles moves the leg inwards towards the middle of the body, allowing you to move your thighs together. Adductor movement of the big toe is brought about by the adductor hallucis. The plantar interossei are also important in the adduction and spreading of the toes. Difference between Abduction and Adduction? Abduction is the movement of a limb away from the middle of the body, while adduction is the movement of a limb towards the middle of the body. Abduction is caused by the contraction of abductor muscles, while adduction is caused by the contraction of adduction muscles. Abductor muscles have relatively short fibers, while adductor muscles have relatively long fibers. Abductors include for instance, the abductor pollicis longus, abductor pollicis brevis, and dorsal interossei. Adductors include the adductor pollicis and palmar interossei. Fingers are spread apart by abductors and fingers are moved together by adductors. Examples of abductors include the deltoid and supraspinatus muscles. Examples of adductors include the latissimus dorsi and pectoralis major. Abductors include the gluteus minimus and gluteus medius; adductors include the adductor magnus, adductor longus and adductor brevis. Thighs are spread by abductors and moved together by adductors. Abductors include the abductor hallucis, and dorsal interossei, while adductors include the adductor hallucis, and plantar interossei. Toes are moved apart by abductors while toes are moved together by adductors. Hand muscles Abductor pollicis brevis abductor pollicis longus, dorsal interossei. Fingers are spread apart. 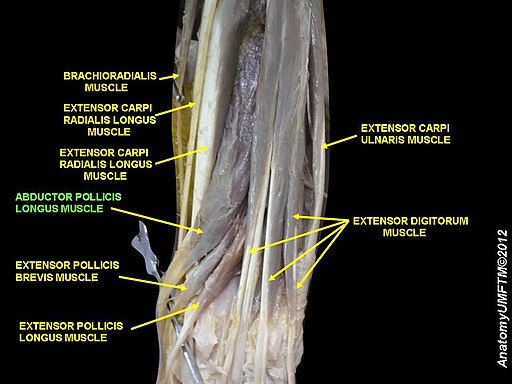 Adductor pollicis, palmar interossei. Fingers are moved together. Leg muscles Gluteus minimus, and gluteus medius. Thighs are spread. Adductor magnus, adductor longus, and adductor brevis. Thighs are moved together. Foot muscles Abductor hallucis, and dorsal interossei. Toes are spread apart. Adductor hallucis ,and plantar interossei. Toes are moved together. 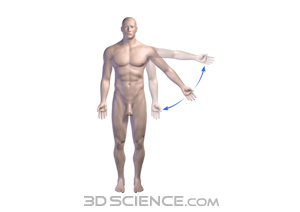 Abduction is the movement of a limb or structure away from the middle of the body. Adduction is the movement a limb or structure towards the middle of the body. Abductor muscles tend to have shorter fibers than adductor muscles. Different muscles or parts of muscles cause abduction or adduction of the arms, legs, hands and feet of the human body. Khavin Aaghan. "Difference between Abduction and Adduction." DifferenceBetween.net. July 16, 2018 < http://www.differencebetween.net/science/health/difference-between-abduction-and-adduction/ >. Abducts takes away from while Adducts brins closer to the main body. Lieber, Richard L., and Samuel R. Ward. "Skeletal muscle design to meet functional demands." Philosophical Transactions of the Royal Society of London B: Biological Sciences 366.1570 (2011): 1466-1476.